I believe in reaching out to students and the community to share my passion about the exciting world of robotics. My philosophy is to motivate students to explore the world around them through applications and hands-on experiences in Science, Technology, Engineering and Mathematics (STEM) disciplines. Through this effort, I have developed and administered multiple educational programs for students of all ages. Mentorship has been an ongoing part of my life and career; participating in every capacity in outreach education activities since 2003. Currently, I serve as the Director of the Fort Lewis College (FLC) Robotics Club. This club is designed to create a sustainable culture of STEM engagement, creating Middle School, High School and FLC communities around real research and development activities, and linking them to ongoing public programs and facilities of FLC. The club provides targeted programs of Professional Development (PD) for teachers, closely aligned with workshops and projects undertaken by their students. We will enable students to form and maintain their own technology clubs, to link those back to FLC's programs and student clubs, and then to showcase the activities in public events and ongoing digital displays on campus. The project advances FLC engagement through targeting both teachers and students in the school community to build a sustainable partnership, and by building a pathway for student participants to lead within their schools, to mix with the undergraduate community, and to become on-campus leaders in their turn when they come to FLC. Previously, I have served as the Co-Director of External Engagement Programs for the School of Electrical Engineering and Computer Science at the Queensland University of Technology (QUT). My role is to develop and implement hands-on robotics, games design and programming workshops for students who want to get a serious taste of new technologies and their applications. I also serve on a committee to develop public programs in Robotics and Engineering for the Institute of Future Environments at QUT. For more information about the engagement programs that are offered at QUT, visit The Cube website to see What's ON! We are currently developing educational programs at Fort Lewis college that focus on the teaching of STEM topics through robotics and hands-on experiences in the mechatronics field. We currently run a robotics club for students of all ages that is focused on learning how robotic systems interact with their environment. Previously, at the University of Hawaii, I co-developed and co-directed two separate educational programs; Robo-Nemo for children under the age of 8, and STOMP@HI - Aquabotica for students aged 8+. During my time in the Robotic Embedded Systems Laboratory at the University of Southern California, I developed and directed the STOMP@USC outreach program for students aged 8 - 18. Since 2008, I have engaged with more than 9000 students through the educational robotics programs that I have developed and implemented. 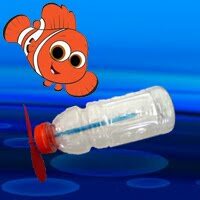 Robo-Nemo is a program designed to introduce young students to the science of underwater technology. This program was designed at the University of Hawaii by Ryan N. Smith and Monique Chyba (Department of Mathematics). Through this program, students experience the unique opportunity of being in contact with research scientists in an academic setting. It is designed to be hands-on and interactive, including university faculty, postgraduate students, research staff, teachers, and students alike. The program consists of a classroom visit to introduce the basics and motivate material, construction of a submarine, and a field trip to the University, where children interact with an actual underwater robot. STOMP (Student Teacher Outreach Mentorship Program) is designed to create partnerships between STEM "experts" and K-12 classrooms to assist K-12 teachers in developing and implementing interactive STEM lessons. Experts in the form of university students, high school students, and industry employees collaborate with K-12 educators to develop curriculum and resources aiding the long-term sustainability of STEM education. Teachers benefit by gaining knowledge of STEM concepts, and becoming more comfortable with the implementation of engineering-based activities in their classrooms. STOMP mentors benefit benefit via the opportunity to work with their local community, gaining communication, teaching, and leadership skills. STOMP was originally created at Tufts University and has been extended to many other universities and institutions across the world. If you are interested in bringing a robotics program into your classroom, coming to QUT to participate in a workshop or public program, or contributing to providing outreach for STEM education, please contact me. KHON2 News: Kids on Campus!